When a boss tries to bring his employees “in line”, he wants them to share a single strategy. 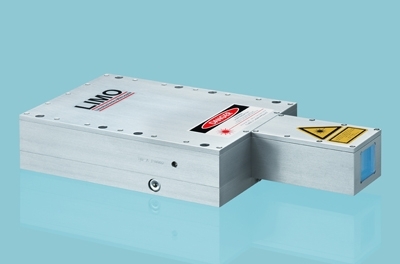 Instead of people, LIMO has arranged a high power laser diode in line when creating its new line generator. Compared to point-like editing, this technology benefits from an increased throughput and better quality. "Anybody trying to impress industry insiders with something new, should better have something really interesting in store", said Dr. Oliver Homburg, Director of Advanced Optical Solutions at LIMO, referring to the international optical industry fair Photonics West (SPIE). Next February, LIMO will present its new line generators in California. (IMAGE: Line laser with short lines (450 Watt, 12 times 0.1 square millimeters). Phonotonics West 2013: LIMO will be presenting its new high power diode laser line generators in San Francisco next February; these generators are especially suitable for processing, organizing and refining surfaces. "We bring those high power laser diodes in line by using lenses and so-called homogenizers", explains Dr. Homburg. "This parallel processing allows to laser an area more quickly than with deploying a point-like spot working on an area via scanner and mirror". LIMO has opted for a modular system which allows the Dortmund based company to customize solutions for many different applications using standard components – with different line geometry, wavelengths and performance classes. "Thanks to this scalable concept, generators can be tailored for all lengths and outputs", says the optics expert. "Also, thanks to our expertise in laser optics, our generators benefit from a very high homogeneity and efficiency." This new generation of generators supports processing, organizing and refining surfaces. There are already line lasers with short lines (450 watts, 12 times 0.1 square millimeter) serving as inexpensive standard solutions in the thermal processing of silicon, for example. The generators structuring AMOLED (active matrix organic light emitting diode) displays with 80 mm long lines supply several kilowatts of power. This technology is designed to add to the changing energy policy: A line laser (40 watts of power, 808 nanometer wavelength and 165 millimeter line length) is able to scrutinize solar cells using the so-called photoluminescence spectroscopy. Dr. Homburg: "Our newcomers have proven themselves suitable for areas with very high demands on laser technology."